Good afternoon! It's a rainy one here in Red Bulls Land and our team is back in League action @The Cathedral of Football. It's a not very common Sunday game, with a not very common Sunday start time, against west coast juggernaut Chivas USA (7pm et, MSG+ & Galavision). To say that Chivas USA did not start off the season well would be a massive understatement. The club lost it's first three games and tied the next three. They then managed to win their next two, but are just coming off a dissapointing loss @Real Salt Lake. A bit of controversy in that last loss, as a Chivas USA player (Mondaini) had a horror tackle on RSL's Javier Morales, pretty much ending his season. Despite all this, Chivas USA players will be eager to prove themselves and get back in the win column. 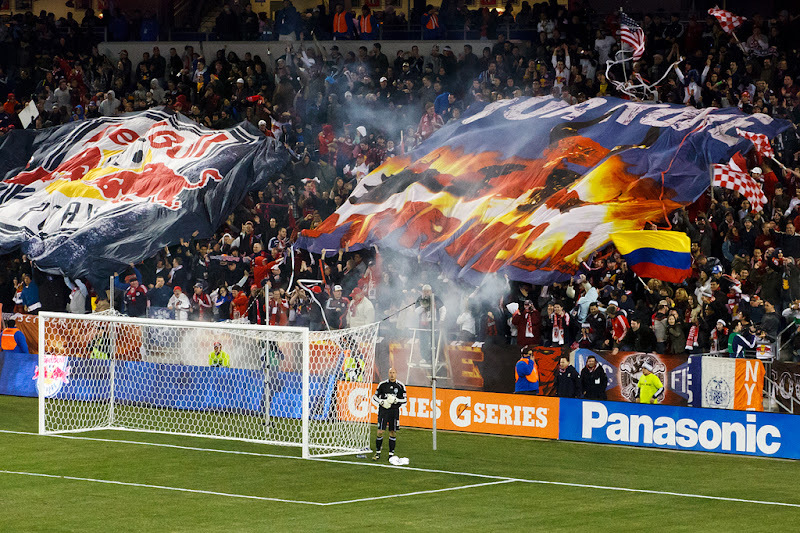 The Red Bulls sit top of the Eastern Conference and are coming off that epic tie @Los Angeles last weekend. I'm not going to count that midweek friendly loss @Montreal, as many players were rested and many played only half the game, or less. That said, this will be a very, very tricky game, as the lack of preparation, along with the rain, might put a damper on RBNY's performance today. The good news is that stalwart defensive midfielder Teemu Tainio is should be back from injury. So with all that in mind, let's get to some predictions! The Red Bulls have been so solid this season at the Cathedral of Football that I can't predict anything but a win against a Chivas USA side that still has some major issues and a few players suspended. Yes, this is our third game in eight days and yes, some players might be getting a little fatigued, but I like us to do the business at home and continue our good run of form. Eventually DeRo is going to have a breakout game and I think it could be this week. So I'll go for a 2-0 RBNY win, with goals by Henry and DeRosario. I'm also going with a RBNY win today. I'm going to say that, in the rain, they'll go nuts, as they did against San Jose, and score several. Like Matt, I'm going to predict that DeRo will use this one to break out of his goal scoring funk. He'll get one, if not two, the defense will hold and the Red Bull will win 3-0. Chivas don't have enough about them to overcome the Red Bulls current run of form. Although tired and without enough practice, they'll dictate the pace, bolstered by the return of Teemu Tainio. I see the Red Bulls taking all three points with a somewhat dull 1-0 victory. Give the goal to Dane Richards. Urgh. Attacked by a bout of pessism, I'm more worried about this game than any other this season (other than Philly, and that didn't turn out too well!). Side flying high versus side considered by some to be one of the worst in the league - straightforward, right? Usually in these situations the unexpected happens, especially with teams I follow. We're at home and have a full strength side again, plus our form is good. Why am I worried? I don't know, it's just a vibe, and that's worse than making a constructive analysis. I'm gonna sit on the fence and say a disappointing 1-1 in which we don't convert chances and give up a sloppy goal. Well this has to be a home banker!!! I will be stunned if we don't win by 3 goals at least. Come on. Andrew Boyens is a starter for them and he has to be replaced today. I would not be shocked to see an epic scoreline. 6 or 7 nil (to RBNY). Wow! That's borderline insanity from YSC, but here's hoping his prediction comes true. We'll have our award winning coverage of this one within the next few days. Viper out!